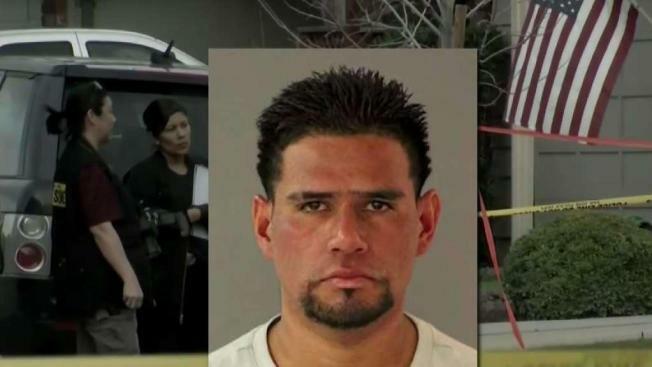 The 24-year-old "transient" who was arrested in connection with the brutal slaying of a 59-year-old woman in South San Jose last month is an undocumented immigrant with a long criminal history, officials said. Carlos Eduardo Arevalo Carranza, a Salvadorian national, was arrested Monday and booked into the Santa Clara County jail for murder, officials said. U.S. Immigration and Customs Enforcement said agents tried to deport Carranza nine times before, but their detainer requests were not honored in Los Angeles and Santa Clara counties, both so-called "sanctuary cities." In every occasion, local authorities declined to cooperate with a federal request to hold Carranza in jail due to his immigration status — as is often the policy with "sanctuary cities" and counties — and he was released back on the street. ICE typically asks jails to hold undocumented inmates for an extra 48 hours after they would otherwise be released in order to get a warrant to begin deportation proceedings. The Department of Homeland Security has said that complying with these requests is voluntary because keeping someone in jail without a warrant violates the 4th Amendment. In Santa Clara County alone, Carranza has prior convictions for kidnapping, drug possession, battery on a police officer, trespassing and burglary. Carranza was diagnosed with psychosis back in 2016, according to a source. Erik Bonnar, an acting field office director for ICE, said Carranza has been arrested numerous times for criminal activity and convicted of more than 10 crimes in the past three years. He called for lawmakers to reconsider a policy that ignores federal hold requests for predatory felons. "How many more people have to be killed or injured before California lawmakers will open discussions to revise the state policy prohibiting local law enforcement agencies from working with ICE to apprehend dangerous criminal aliens?" Bonnar said in a statement. "It’s unfortunate that our communities face dangerous consequences because of inflexible state laws that protect criminal aliens. These sanctuary policies have unintended, but very real, and often tragic consequences to public safety." In a press conference Tuesday afternoon, San Jose Police Chief Eddie Garcia did not mince words. Garcia also said Carranza stalked Bambi Larson and the South San Jose neighborhood where she lived for some time before allegedly beating and stabbing her to death. The chief said Larson's son and a co-worker discovered her body on Feb. 28 at her home on the 900 block of KnollfieldWay, just east of the Almaden Expressway. Both were checking on her after she didn't show up for work. Police said Larson's body was found with multiple stab wounds and determined it was a homicide. Neighbors also shared surveillance video they believe shows the suspect walking to and from Larson's home on the day of the murder. At one point, surveillance video shows the suspect wiping his face with a shirt as he's walking away from the home. "Hopefully, they've got the right person and they'll pay for it for what they've done to take away a beautiful, beautiful person," neighbor Laura Bisceglia said. Larson attended San Jose State University and the University of California at Santa Cruz, and was a manager at medical testing company Roche Sequencing Solutions in San Jose.